After 15 years of construction, harrowing spacewalks and repairs the International Space Station is still going strong in orbit around Earth. The first module for the station — the Russian Zarya module — launched 15 years ago today, on Nov. 20, 1998. Currently, the International Space Station is the largest structure in space ever built by human hands, and international crews have continuously occupied it since 2000. Take a detailed tour of the International Space Station from the inside out in this SPACE.com infographic. See the full image here. 2001: The year Dennis Tito, an American multimillionaire entrepreneur, became the first person ever to fly to the station as a self-funded space tourist. He reportedly paid $20 million for the flight and stayed on the station for eight days before flying back to Earth. 357: Overall length of the station in feet (109 meters). It's about the length of a U.S. football field, including its backbone-like truss segments and solar wings. 174: Spacewalks taken to assemble and maintain the station to date. More than 115: Number of spaceflights taken by five kinds of launch vehicles during the station's construction. Russian elements were launched to space by proton rockets, and NASA's space shuttles brought other components into orbit. The space shuttles and Soyuz capsules were both responsible for bringing crews to the station until the shuttle program was retired in 2011. 90 minutes: The time it takes for the station to make a complete orbit of Earth. Observers on the ground can see the station pass by overhead by tracking it using tools provided by NASA: http://spotthestation.nasa.gov/. 38: Current number of expeditions that have launched to the station. Japan Aerospace Exploration Agency (JAXA) astronaut Koichi Wakata; Russian cosmonauts Mikhail Tyurin, Kotov and Ryazanskiy; and NASA astronauts Rick Mastracchio and Mike Hopkins are currently living and working aboard the space station as the Expedition 38 crew. This NASA infographic outlines the major features and accomplishments of the International Space Station during its first 15 years in space. The image was released to mark the station's 15th birthday on Nov. 20, 2013. 6 months: The average length of time a crew spends on board the station. 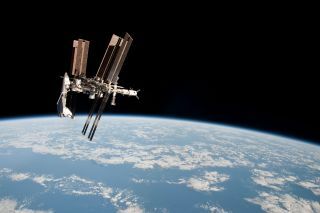 In 2015, a U.S. astronaut and Russian cosmonaut will attempt the first-ever one-year mission to the International Space Station. 5: Number of space agencies that contributed to building the station. NASA, Russia's Roscosmos, the Japanese space agency, the Canadian Space Agency and the European Space Agency all contributed to the construction of the station. 3: The size of the first station-crew in 2000. It is also the number of spaceflyers that can travel to the station on a Russian Soyuz spacecraft, currently the only spaceship that can deliver station crewmembers to the orbiting outpost. 2: Number of private American companies that now fly robotic resupply missions to the space station. So far, SpaceX has flown two official cargo missions to the space station using the company's Falcon 9 rocket and Dragon capsule, while Orbital Sciences Corp. has flown one mission using its Cygnus spacecraft and Antares rocket. Both companies have contracts with NASA that will keep them flying to the station. 2: Number of times an Olympic torch has been on board the space station. 1: Number of times an Olympic torch has been taken on a spacewalk outside the space station. On Nov. 9, 2013, Russian cosmonauts Oleg Kotov and Sergey Ryazanskiy took a torch for the 2014 Winter Games in Sochi, Russia, on a spacewalk.